The charter of the first King of Portugal D. Afonso Henriques to thirty settlers who inhabited the Castle of Sintra dates from the year 1154. The same King delivers to the Knights Templar "some good village houses" in 1156 which is thought to be the place of the current Café Paris and the Hotel Central. In the sixteenth century Sintra was already visited by numerous artists. By this time the construction of Summer Estates that little by little punctuated the landscape began. In 1755 the town of Sintra also suffers the effects of the earthquake that hit Lisbon and it was therefore necessary to rebuild the Old Town. In the nineteenth century the town of Sintra was a great inspiration for artists and writers, which attracted increasingly Nobles and the Bourgeoisie of the time, who consequently built up Palaces, Manor Houses and Chalets. At that time one of the most prestigious properties - QUINTA DO SALDANHA - was built. Now part of the history of the town of Sintra. Marquis de Saldanha, maternal grandson of the Marquis of Pombal, prime minister of King José, ordered the construction of the property in 1830. The property is built on the mountain and in the shadow of the Moorish Castle with a view over the National Palace of Sintra. Two houses are built in the property: one at the higher and another on the lower level. The former for the Marquis and the latter for his mother. His mother's house was named 'Italian House' because it was designed by a prestigious Italian architect. By 1840 the Marquis de Saldanha was appointed Ambassador in London where he remained a few years. Some historians have regarded his departure as a career-ending golden exile. At that time the estate was sold to an English family. 'Casa Italiana' (Italian House) returned to the possession of the descendants of the mother of the Duke of Saldanha, who was the daughter of the first Marquis of Pombal by his second marriage to D. Ernestina Wolfange, Countess of Daun - Austria - member of one of the most illustrious families of Vienna in Austria. Casa Italiana has a coat of arms of the daughter - The Countess of Rio Maior, Amalia de Carvalho Daun e Lorena de Saldanha Oliveira e Sousa - painted on the ceiling of the entrance porch. The coat of arms has an eagle with a key in its beak symbolizing the history of the first Count of Daun who was arrested and imprisoned by a rival in a tower of a Castle in Bohemia. His friends tamed an eagle teaching it to fly with a key in its beak to the window of the tower so that the Count could open the prison door and escape. 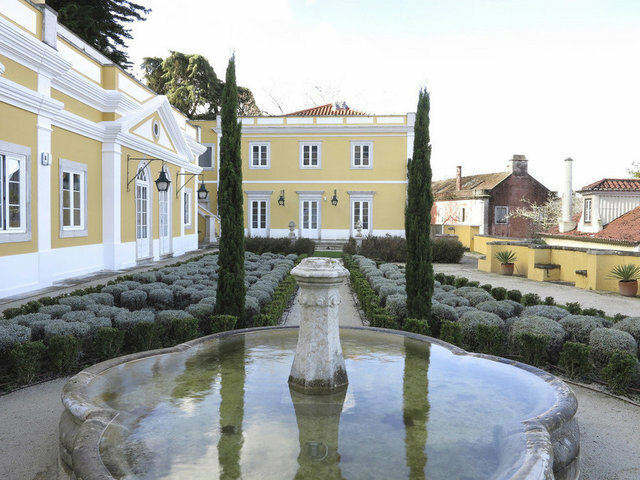 Still in possession of the Countess of Rio Maior, Casa Italiana was inhabited by several distinguished personalities such as the Duke of Wellington, the Manperrin Family, the great Portuguese industrial Alfredo da Silva. At the beginning of the twentieth century, the Italian house was inhabited by the Saldanha Family again, who donated the higher house of the property, as well as part of the property to the Patriarchate of Lisbon and sold CASA ITALIANA to the Stilwell family, who inhabited the property until December 1987. On that year and month the Stilwell Family sells the property and during two years the property undergoes restoration works, both outside and inside.